Did you know? The Tower of London was once home to a Royal Menagerie of animals including lions, tigers, polar bears, elephants, alligators and kangaroos. 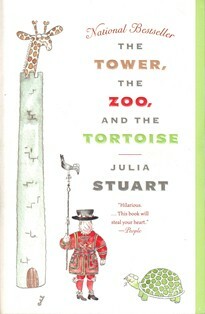 This piece of trivia inspired Julia Stuart to write The Tower, the Zoo and the Tortoise (published in the UK under the title Balthazar Jones and The Tower of London). This is a lovely little book. It tells the story of Balthazar Jones, a Beefeater who lives in the Tower of London with wife Hebe Jones and Mrs Cook, the world’s oldest tortoise. Balthazar is tasked with the responsibility of reinstating to the Tower Queen Elizabeth II’s Royal Menagerie. Hilarity and calamity ensue. The Tower, the Zoo and the Tortoise has a lovable cast of characters. Stuart writes with a similar style of humour to Alexander McCall Smith (The 44 Scotland St series and The No 1 Ladies’ Detective Agency). Despite being set inside the Tower, my favourite parts take place in the London Underground’s Lost Property Office, where Hebe Jones and her colleague Valerie Jennings reunite an intriguing array of objects with their owners. Coincidentally enough, The Tower, the Zoo and the Tortoise has inspired its own piece of trivia. It achieved fame and broke into the top 25 of the New York Times hardback fiction list after US President Barack Obama and his family took it on holiday in 2010. *Please note: You won't pay more if you purchase via these links, but they will give me a small referral fee (5%). Find The Reading Experiment on Facebook here and on Twitter here. PS I am a follower of your blog. I know you have linked in before, too – which is great. Would you consider following Carole's Chatter back – or are you already? Thanks Carole - I have posted a link and yes, I am now following your blog. Oooh, fantastic. Thanks for linking this in to Books You Loved: October. If you pop back in a day or so there will be even more good book links to check out. Have a great week. I read this...it is great history and has terrific, funny characters. Thanks for the reminder.